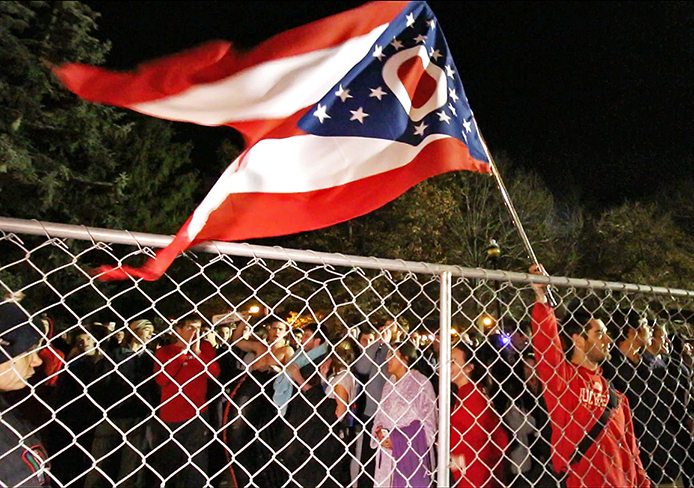 A man holds an Ohio flag over fences surrounding the Mirror Lake area on Nov. 24. 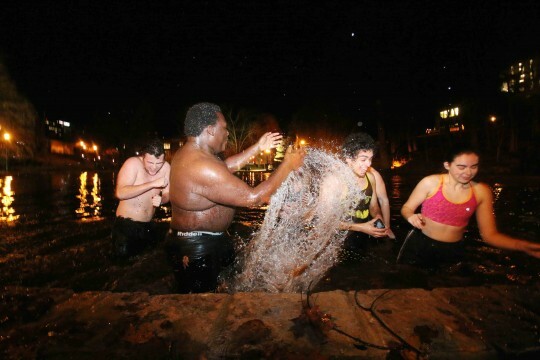 For a while, it seemed as though the ducks might make more of a splash than any students. Last year, students jumped in the lake a night early in response to a university policy change that required them to get wristbands to enter the Mirror Lake area for the traditional jump before the Michigan game. 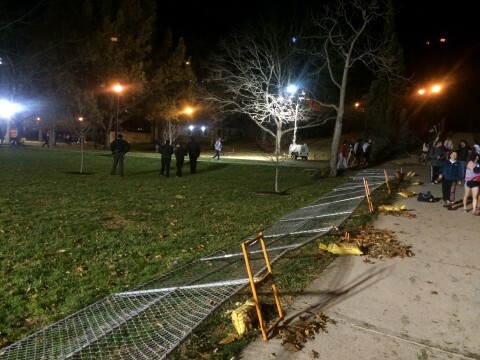 There were also fences erected around the area prohibiting entry. This year, students also jumped a night early, on Monday, to protest the fences and wristbands. 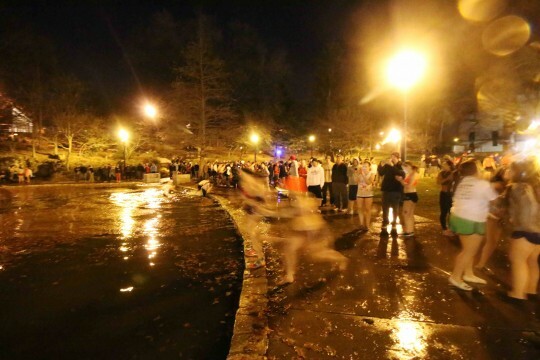 As of Monday evening, more than 380 people had responded to a Facebook event for “Mirror Lake Monday” saying they were going. 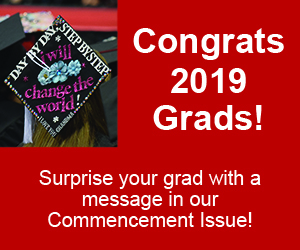 The event was slated to occur at 8 p.m.
A student who helped organize the event — who asked to remain anonymous because he was currently pursuing a job and didn’t want to be associated with the event — said he created the event after being involved in last year’s early jump. “I created this event in part since I was involved in organising (sic) the Monday night jump last year on OSU’s subreddit and the other students that were involved last year have either all graduated or have no interest this year,” the student said via Facebook message. The student added that he wasn’t sure how many people would actually show up. 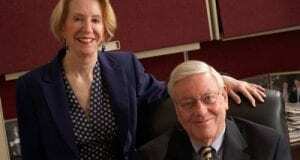 “I do believe that opposition to the university administration’s sponsorship and regulation of the jump is widely held. 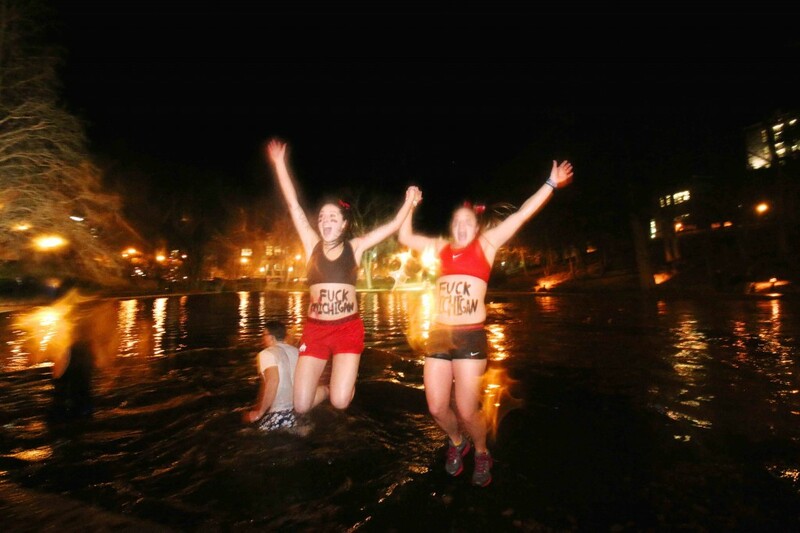 I’m not sure however how many students will be willing to voice/display their opposition with police present at Mirror Lake,” hesaid. 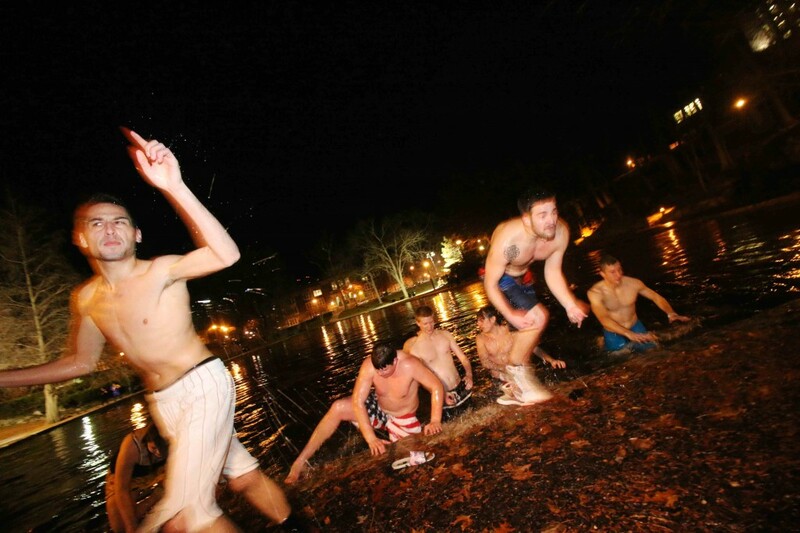 At about 8:45 p.m., before there was a police presence around the lake, a group of nine students jumped in, although it seemed to be out of convenience rather than rebellion. 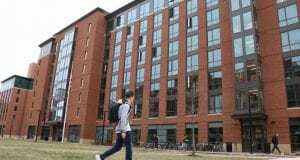 “I’m working before and during the actual jump tomorrow,” said Alex Cohen, a fourth-year in computer science and engineering. “I’m leaving tomorrow to go home for Thanksgiving break,” said Zach Ponath, a first-year in visual communication and design. 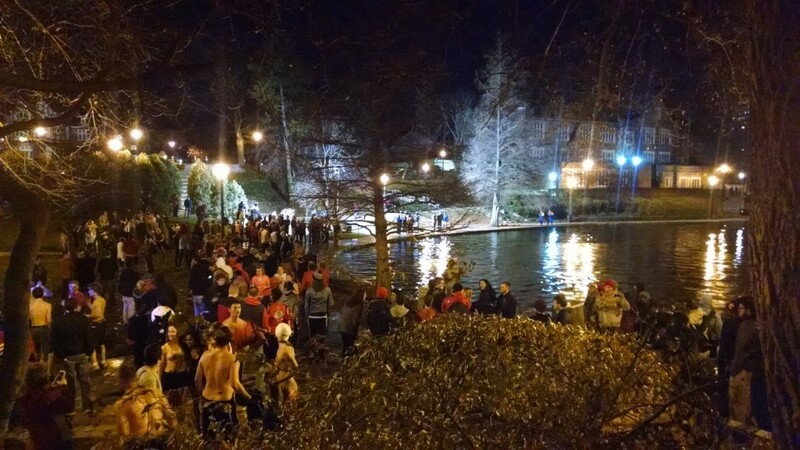 While University Police and Columbus Division of Police officers were present throughout much of the night, they did not appear to be stopping students from entering the lake. A University Police officer referred inquiries to Capt. David Rose, who was not available for comment Monday evening. Two members from Student Safety Services, who were with the police officers, declined to comment. 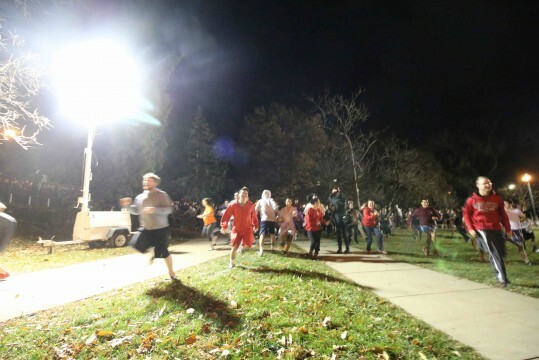 But then officers started closing the fences and escorting any would-be jumpers out of the area, and before 10:50 p.m., all entrances were closed off. A group of about 30 students, however, found a gap in the fence along 12th Avenue and rushed into the lake screaming. An officer tried to calm the crowd of students, saying that the lake wasn’t safe to jump in, but it was to no avail. At about 11:30 p.m., a lone man ran through a gap in the fence, and the crowd reacted by cheering and subsequently knocking down the fence to join him at the lake. 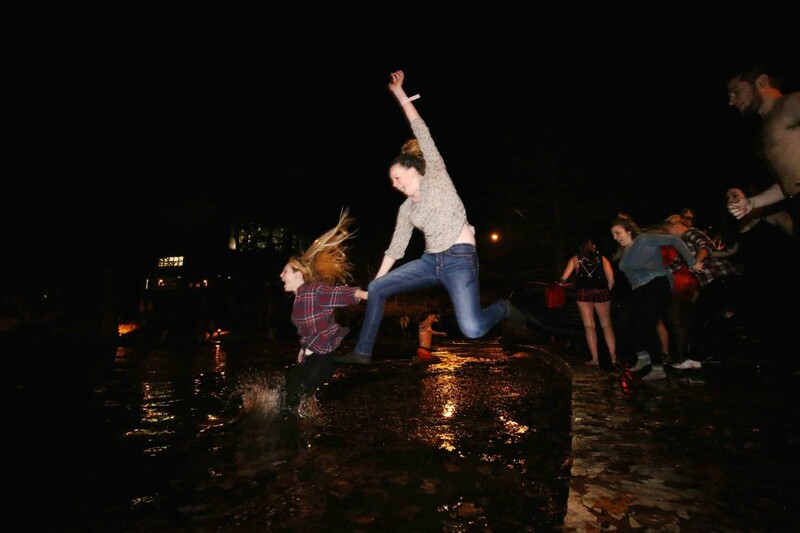 No arrests were made Monday night, according to a Columbus Police officer, and students continued jumping past midnight. E.J. 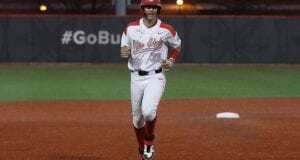 Powers, a first-year in marketing, didn’t doubt that he’d get to jump Monday night. 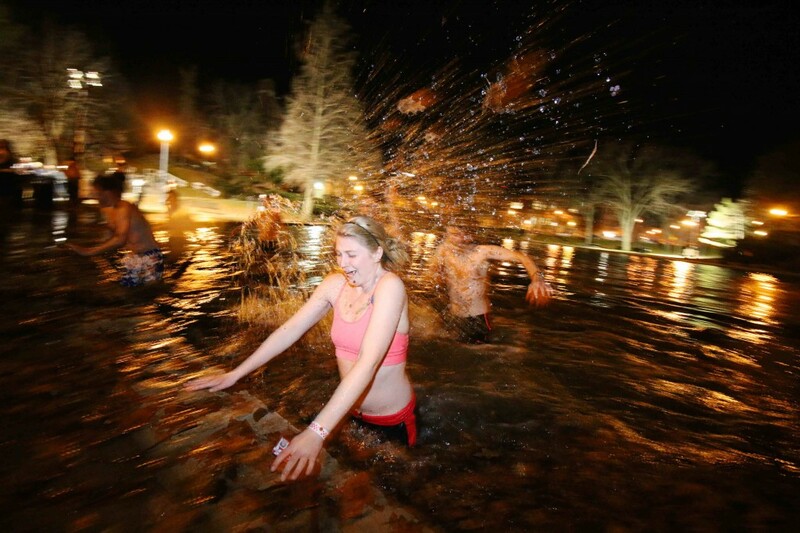 Powers — along with a couple thousand of his OSU classmates, according to a Facebook event for the Mirror Lake jump — plans on jumping Tuesday night as well. these kids are idiots. Your only accomplishment is that prove to everyone that you are whiny imbeciles. Grow up and find something else to make you feel good about yourselves. 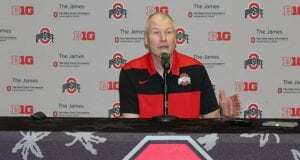 This is a long lived tradition at OSU if you have never taken part then you should not run your _outh. 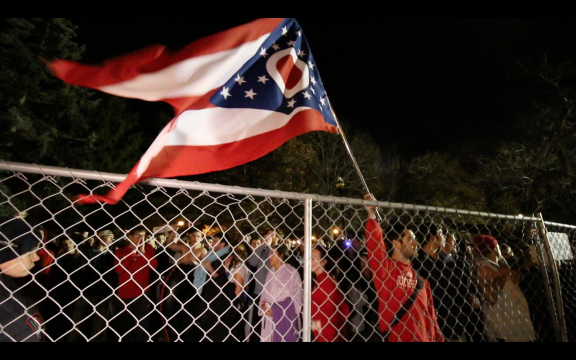 #du_bass..
No Columbus Police officers were there. Poor reporting and full of innaccuracies. Way courageous. You should have a bright future on Wall Street. Ricky, how would a prayer vigil do anything? You think prayers from students will prevent riots and looting? 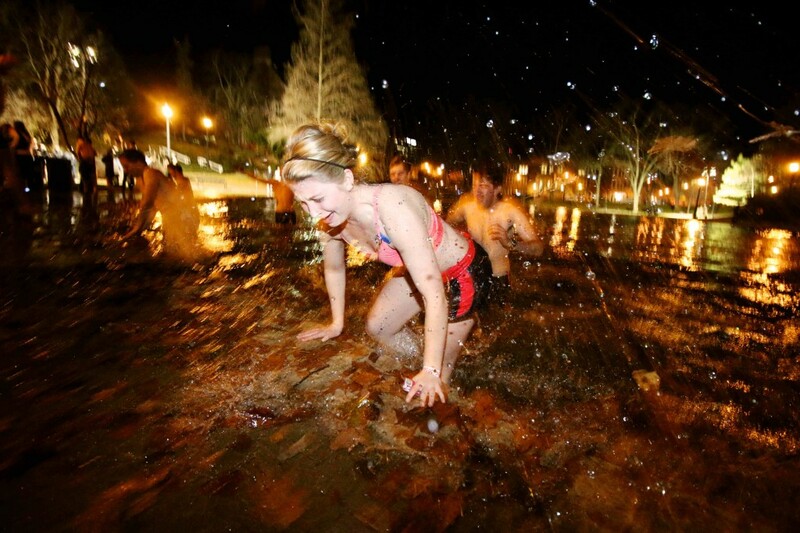 Yeah, and jumping into Mirror Lake is idiotic. Get off your high horse; if you wanted to do something that “really mattered” in Ferguson, how bout going there to help clean up the damages? Or donating money to shopkeepers whose livelihoods were destroyed? Don’t just send them prayers, make a freaking difference or just keep quiet. The people who put up the fences reasonably should have known this was going to happen. Fire everyone. Ricky I’m so glad your sense of self-importance has been left intact after the traumatic embarrassment you must be feeling. That should tell you that what you’re doing is stupid and wrong…it’s called a conscience. Mr. Drake, tear down this fence!!! these kids are idiots. Your only accomplishment is that prove to everyone that you are whiny imbeciles. Grow up and find something else to make you feel good about yourselves! Paul- considering that comment, your sense of self-importance seems pretty immense without your, you know, actually being important. 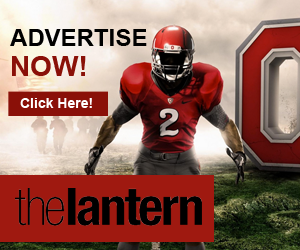 Funny that The Lantern doesn’t do the “(sic)” thing when Urban Meyer botches his grammar, most glaringly when he uses “good” as an adverb describing how the team played. They could really mitigate this tradition if the university reworked Thanksgiving Break to be the entire week. 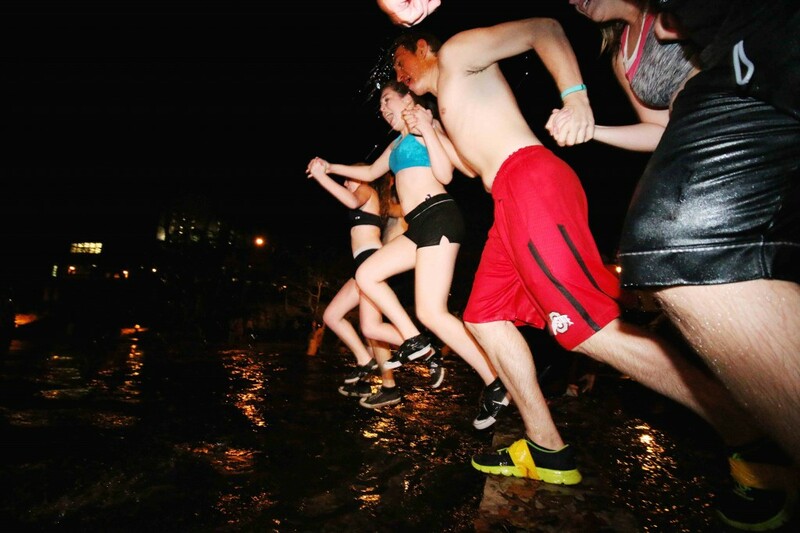 Most students would not spend three or four days in Columbus just to jump in Mirror Lake. Right. 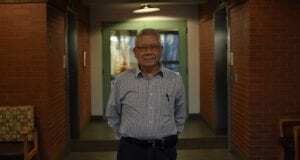 They could further mitigate the tradition by eliminating the students entirely. Then they would quickly realize the staff and the football game exist because of the students, not the other way around! The people who are calling the students idiots are hilarious. 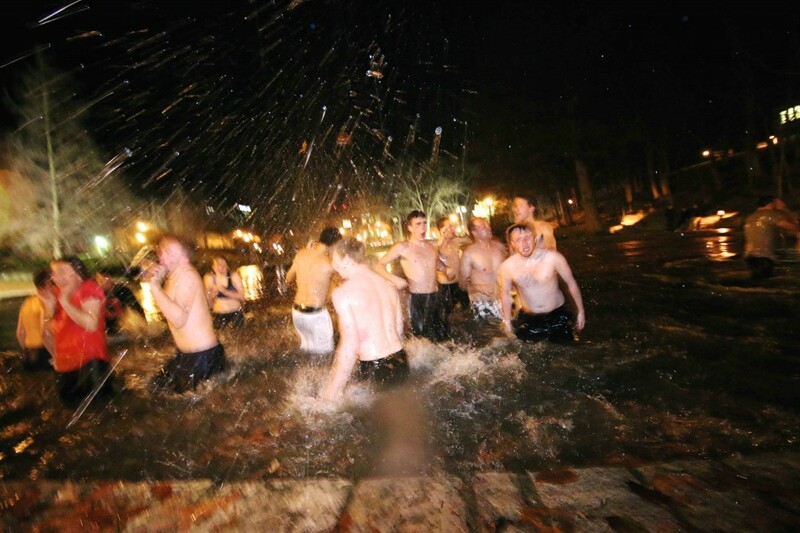 You must not have had fun in college… or ever did something crazy in the spirit of the tradition/school that you love! Long live the Mirror Lake Jump!! Also the people who troll the Lantern and point out its mistakes…. take a look at how you’re spending YOUR time and maybe YOU should consider something more productive that contributes to society… not correcting a student ran paper’s writing style. The fences are a terrible idea. There’s a bottle neck created with continuous traffic flow in and out of the openings which leaves students in the cold longer than they have to. Also now there’s no way to get an ambulance in if someone needs medical attention on the far side of these entrances because of the fences. 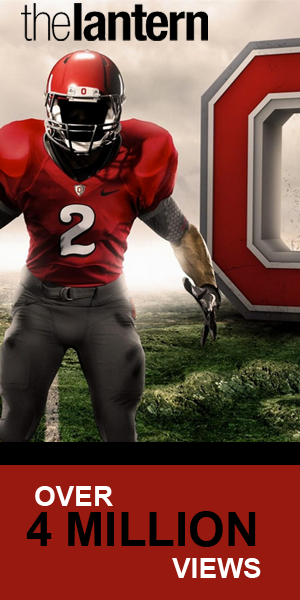 And if the kid is wearing a wristband they can sue the university because they sanction this event… Well done OSU. Wasn’t happy about how the jump was sanctioned last year, and I still think its equally stupid for the above reasons this year. This whole thing is hilarious. I can picture the highly paid executive tight asses that run Ohio State spending hours in a fancy conference room nervously debating how to “sanction without sanctioning” a decades old tradition so they can appear to be respectful of the tradition while still making it safe and orderly. Of course all this is in the name of covering their butts from lawsuits and hate mail. Did they pay a PR firm and team of lawyers hundreds of dollars per hour to come up with this iron-clad plan for fences and wristbands? The fences are a terrible idea. Build a moat and fill it with water instead. This was an obvious violation of Title [insert favorite Roman numeral here], the Geneva Convention, the Magna Carta, global warming, and Hoyle’s Rules of Euchre. Having occurred under Drake’s watch (between his cocktail parties), he should be sacked based on these and any other lame reasons that the Board of Trustees can conjure up, and with the same due process Drake has bestowed upon others.